Which company goal are you playing a personal role in pushing forward? Is the board actively engaged in developing strategy or green lighting management’s plan? What key numbers help tell your company’s story? How does the company navigate conflicting stakeholder goals? It's time for a boardroom gut check. 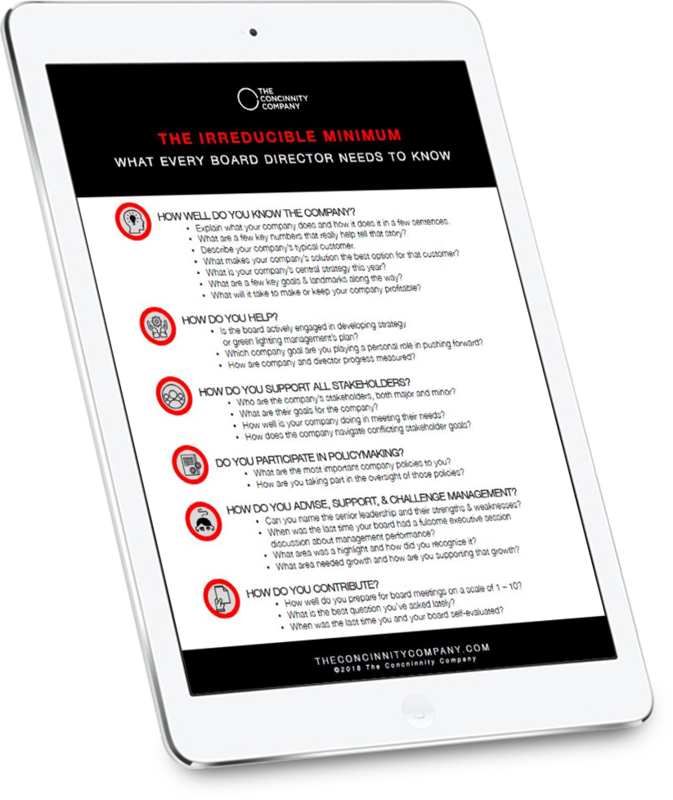 We believe that every board director needs a strong working knowledge of their company. Do you know the "Irreducible Minimum" about your company? Our quick guide will make sure that you do. Over our 100+ years of boardroom and C-Suite experience, we've been on both sides of the boardroom line, and the cornerstone to having meaningful, effective conversations between the board and management is everyone being on the same page. As board directors, that means we need to truly understand the company we are serving in order to connect with and influence the CEO.